The building that will house RITâ€™s MAGIC Spell Studios is scheduled to open fall 2018. With a touch of virtual reality and a Hollywood-style movie trailer and poster, Rochester Institute of Technology today launched the building that will house MAGIC Spell Studios. The program is a first-of-its-kind effort in higher education that will link RIT’s internationally ranked academic programs with high-tech facilities needed to commercialize computer gaming, film and animation, and digital media projects. Lt. Gov. Kathy Hochul (D-NY) and Assembly Majority Leader Joseph D. Morelle joined university officials—including RIT President Bill Destler—Danny Wegman from The Wegman Family Charitable Foundation, and representatives from Dell and Cisco Systems Inc., at the ceremony held Nov. 15 in RIT’s Student Innovation Hall. “It really is very gratifying to see how the idea for MAGIC Spell Studios is being realized thanks to the efforts and tremendous support of many of you here today,” said Destler. “I do believe that this initiative will contribute to the continuing transformation of our regional economy thanks to a culture of innovation and technological expertise that has enabled this community to continually reinvent itself. And throughout its 187-year history, university-industry collaboration has been in RIT’s DNA. MAGIC Spell Studios leverages those historical roots as well as the current national rankings of several of our academic programs and our growing stature as a research institution. “I want to express our profound appreciation to the funding partners who have made this facility possible, most especially to Gov. Cuomo and Lt. Gov. Kathy Hochul for the critical New York state funding, our corporate funding partners Cisco and Dell for their investments in equipment and infrastructure, and Danny Wegman and The Wegman Family Charitable Foundation for making it possible for us to include a professional soundstage in the project,” added Destler. The building and initiative are made possible through $13.5 million in funding from New York state, $3 million from Dell, $12.4 million from Cisco Systems Inc., and $1.5 million from The Wegman Family Charitable Foundation. MAGIC Spell Studios has been developing and publishing digital media, such as games, apps, films, art installations and interactives since 2013, creating a collaborative, university-wide endeavor that ties together entrepreneurship, academics, content creation, production and distribution. The 43,000-square-foot building—which will be located adjacent to Frank E. Gannett Hall—is scheduled to open fall 2018. 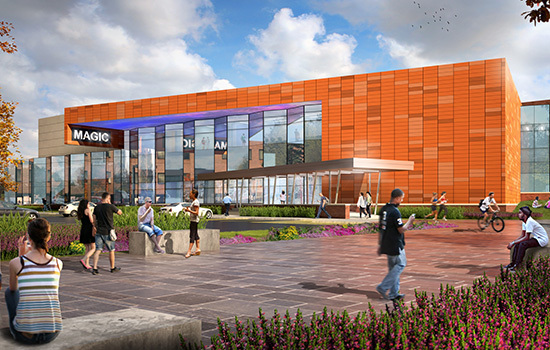 To help accomplish these objectives, the new building will feature a state-of-the-art sound stage, tiered theater with a projection booth and a cinema-quality audiovisual system, sound mixing and color correction rooms, numerous labs and production facilities that will help support RIT’s recent designation as a digital gaming hub, and an innovation zone that mixes faculty, staff, students, technology and infrastructure across programs from the School of Film and Animation, the School of Interactive Games and Media, and the RIT Center for Media, Arts, Games, Interaction and Creativity. There are also plans to dedicate space on a project-by-project basis to both internal start-ups and external partners. According to Phelps, the facility will transform the region and will serve as a showcase and best-in-class example of its kind throughout the northeast. The first and only commercialization studio of its kind in the northeast, MAGIC Spell Studios helps put RIT on par with other world-class universities in this arena, according to Phelps, and is quickly being recognized as an economic driver in the region by helping its students start up and stand out in the digital media space. RIT was also recently named one of three Digital Gaming Hubs in New York state by Empire State Development to increase the economic impact to New York state by fostering innovation and creating collaborative activities that spur new games or companies as well as providing resources and mentoring to encourage students and entrepreneurs to enter the growing gaming industry. In addition, the gaming hubs will assist existing companies with gaming concepts, technologies and trends and host events focused on assisting the gaming community. The emergence of MAGIC Spell Studios is expected to create 35 to 50 jobs in the first five years, with a goal of 100 jobs over the next 10 years. More importantly, it will help create local job opportunities that will give students and new graduates a reason to stay in the upstate New York region, helping reverse what has been called “the brain drain” of local college graduates. In addition, MAGIC Spell Studios will be formally linked to other universities; other local game design and development studios, such as Darkwind Media, Second Avenue Learning and Workinman; and partners like The Strong National Museum of Play to create a professional network, designed to provide resources and mentoring to encourage students and entrepreneurs to enter the growing digital media industry. The effort is focused not just on placing graduates in existing game design studios, but on growing smaller studios and founding new ones. RIT’s MAGIC Spell Studios has already made significant inroads by creating digital products that have hit the marketplace. Super Daryl Deluxe won the 2015 Intel University Games Showcase award for “Best Visual Quality” and the 2015 Microsoft U.S. Imagine Cup-Games category. Splattershmup, which was showcased at the Digital Games Research Association in Germany in 2015, was one of five Best in Show games at the Games+Learning+Society 2015 Conference Learning Arcade in Madison, Wis., and was presented by invitation at the 2016 Indie Arcade at the Smithsonian Museum of American Art in Washington. D.C. In August, Hack, Slash & Backstab became the first video game published by a university to launch on the Xbox One and Steam gaming platforms and available for purchase on the digital storefront Humble. Industry analysts are predicting that with explosive consumer demand for smartphones, tablets and other devices, the international games market will rocket past the $100 billion mark to reach $102.9 billion by 2017. According to the Entertainment Software Association, the video game industry grew four times faster than the American economy between 2009 and 2012, with employment up by more than 30 percent since 2009 report, and the average employee earning average annual compensation of up to $95,000. Among the graduates of its nationally ranked School of Film and Animation are several Academy Award winners. MAGIC Spell Studios would tap into the talented pool of RIT students to make production assistance available to independent and commercial filmmakers, allowing the region to take advantage of and create new opportunities for the state’s popular film and television tax credit program, which Gov. Cuomo has championed as an economic development tool.